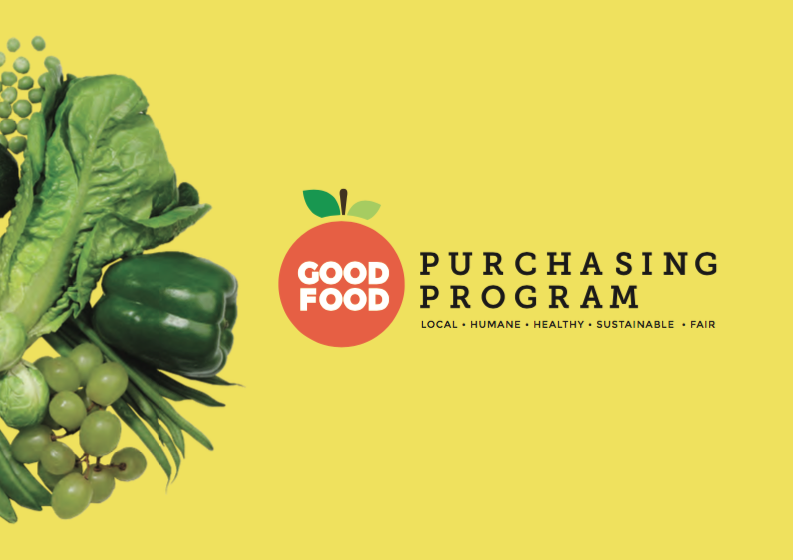 The Chicago City Council’s adoption of the Chicago Good Food Purchasing Program (GFPP) demonstrates a meaningful commitment to values-based food purchasing that contributing to overall health and community wellness. When implemented the measure will impact a significant portion of nearly $200 million in spending toward local food businesses and farmers. At no cost to taxpayers, the CGFPP will prioritize nutrition, affordability, locality, sustainable production practices, sound environmental practices, fair prices for producers and safe and fair working conditions for employees and food workers. encourages healthy food procurement and preparation and a healthy food service environment. Over the past 20 years, there have been big changes in food, with hundreds of new options that help consumers choose foods that are healthier and better for the environment, animal welfare, and workers. For example, organic, free-range, and fair trade. But for institutions, all of these choices can be difficult to navigate and just like individual consumers, they often have no idea where their food is coming from or how it was produced. The Good Food Purchasing Program provides a set of Standards around five values and supports institutions by helping them make more informed decisions about the food they buy. “Food workers comprise not only the largest sector of our economy, but also the lowest paid. By enacting the Good Food Purchasing Program in Chicago, we begin to ensure that these workers, and their families have dignified lives,” said Erika Allen, national program for Growing Power, Inc. and president of the CFPAC board of directors. GFPP was first adopted in Los Angeles in 2012 and has emerged as a national model. It has also been adopted by San Francisco Unified School District and Oakland Unified School District, with at least a dozen cities actively working on adopting the Program across the country, including Austin (TX), Cincinnati (OH), Madison (WI), Minneapolis (MN), and New York.Public health advocates also applauded the City’s adoption, nothing that in California they’ve seen reductions in the consumption of sodium, high fructose corn syrup and processed foods. The GFPP is not only expected to re-direct millions to local produce farmers and other Chicago-based food and distribution businesses but also examine whether or not businesses follow fair labor practices. News of the resolution’s passage is also great news for food workers, many of whom have been fighting for wage parity and paid sick days. “In Los Angeles the Good Food Purchasing Program resulted in over 150 new living wage jobs and improvements in the standards of living for thousands of people, and Chicago can have the same impact” said Jose Oliva, co-director of the Food Chain Workers of America and CFPAC board member. CFPAC also applauds the City Council’s Health and Environmental Protection Committee, chaired by Ald. George A. Cardenas (12th Ward), which unanimously passed the resolution. Food justice advocates will continue to lobby Cook County and state government to adopt its own version of the resolution in the coming days.